Civilisations rise and fall, some more quickly than others. Their legacy often lives on through residual art though archaeologists and historians are inclined to get distracted by coinage, bent forks and chipped potties. 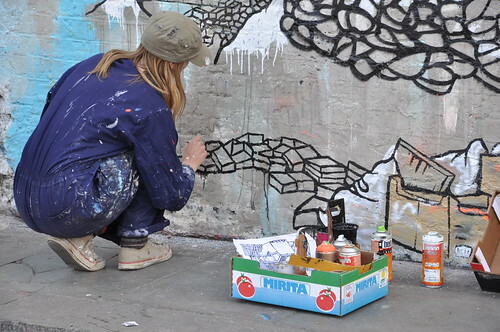 Jo Peel has made her mark with art, animating a complete evolution from idyllic paradise of nature to decayed east end sink high street on the epic Village Underground wall on Holywell Lane, London. 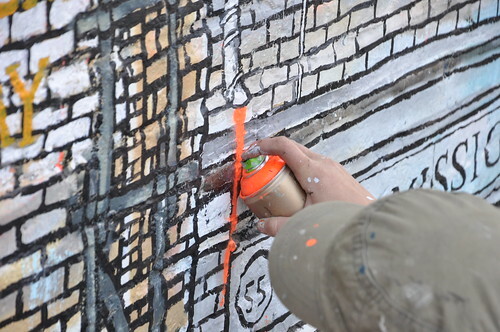 Anyone relying on 3 weeks of good weather for painting an outdoor project in London in March would usually be invited to have their head checked but despite forecasts of biblical tempest on two separate occasions, the weather divinities smiled on Jo who had a prolonged period of exceptional weather for her work. So much so that the failure of one monsoon to arrive per Met Office expectations lead to rain having to be simulated. 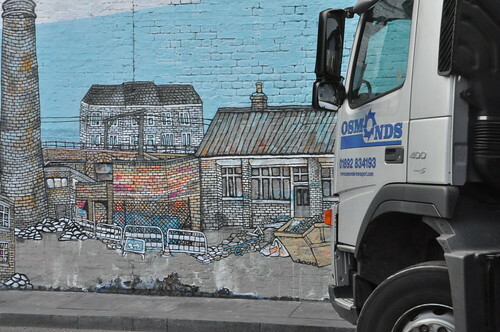 Jo spent 3 weeks on this animated mural and having popped along almost daily for a progress check and chat, Graffoto reports a work ethic that would put many graffiti writers to shame. Using brush and can plus a number of props, Jo was working feverishly, nipping to the side and her succession of volunteer photographers were getting a shot roughly every 3 to 5 minutes. 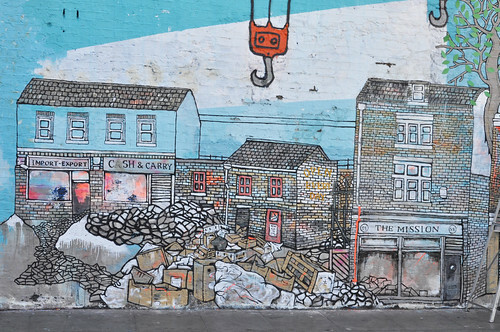 The evolving scene is essentially imagined but in several parts is a composite of London locations including Jaguar Shoes, a Dalston local butcher shop, a Shoreditch architectural mash-up and the barren area with possible swamp overtones could be anywhere South of the river. The end product remained up for a couple of weeks until recently replaced by an ad for a print release. 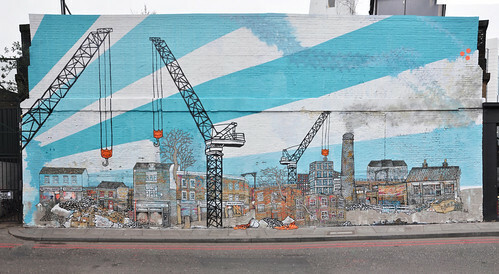 Shoreditch is no stranger to Jo Peel’s work, here is one that beautified a part of Shoreditch last year. 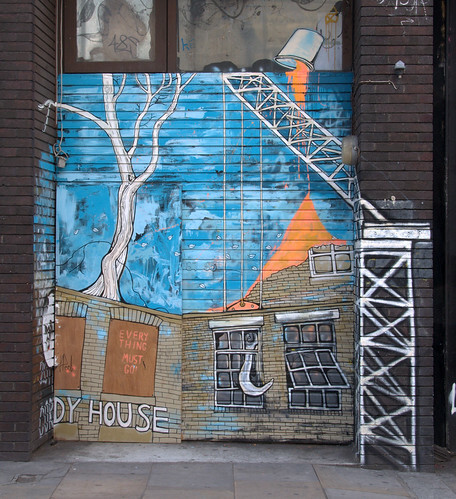 Another thing about this project that restored one's faith in the skinny trousered urbanistas that prance around Shoreditch - Jo left the orange painted stones on the pavement everynight and generally they stayed put. All the good things about the art said, the soundtrack seems to be a bit mis-matched. The tune is fine but in combination with the animation it’s like watching a mute TV while your neighbour forms a loud White Stripes derivative band. Graffoto doesn’t often gratuitously direct you to other graff blog sites but for a comprehensive and interesting interview with Jo about this project, check out this on GlobalStreetArt.